Welcome to Weekend Links! I truly enjoy sharing all of the amazing finds, books and links that I’ve discovered during my weekly Internet travels. Right or wrong, many of today’s kids do most of their reading on electronic devices so this week I thought I would focus on fun and unique eBooks that Entertain Young Readers. Enjoy! 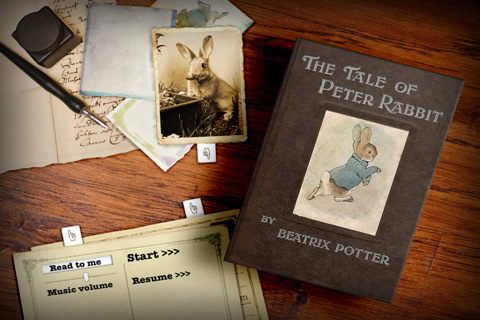 Pop-Out The Tale of Peter Rabbit is an experience unto itself. How many times have I read The Tale of Peter Rabbit? That cute little green book held by my children’s little hands. I cannot think of their childhood without including Beatrix Potter. Loud Crow, the makers of this app have pulled together an incredible team of talented people to delight us with the world of Peter Rabbit. This holiday season, join Charlie Brown and the Peanuts gang around the table for a (very!) unique Thanksgiving dinner. From pilgrims to popcorn, A Charlie Brown Thanksgiving comes to life in this beautifully re-mastered 40th anniversary edition. Magically marrying a book-like feel with clever interactive elements, A Charlie Brown Thanksgiving will leave your senses hungry for a second helping! During the last presidential election there was a lot of discussion about political parties. How are they different ? How are they the same? Who, exactly would make the better leader of our country? Here is an entertaining book which helps answer these questions. Using the cat and dog in a brilliant analogy of what really happens during the political process, author Julia Dweck brings voting and campaigning to life through her creative rhymes and entertaining conclusions. The illustrations are bright and colorful bringing a comic air to this smart book. Usually a topic such as elections can be a difficult task to explain to children in an interesting manner. Not anymore with this winner of a book. We give Cat or Dog for President two thumbs up and 5 stars. We loved it and highly recommend it to everyone !! Based on the award-winning title by Dr. JoAnn Deak and illustrated by Sarah Ackerley, and full of exciting brain workouts, Your Fantastic Elastic Brain is sure to become a favorite among children, parents, and educators. This innovative and timely interactive edutainment app teaches children that they have the ability to stretch and grow their own brains. It also delivers the crucial message that mistakes are an essential part of learning and introduces children to the anatomy and various functions of the brain in a fun and engaging way. Ladybug at Orchard Avenue gives a bug’s eye view of the exciting world just outside a child’s window. Follow this enchanting journey through a ladybug’s miniature world and learn about the predators she faces, the aphids she hunts and what secret place she will call her home for the winter. Reviewed by the Smithsonian Institution for accuracy, Smithsonian’s Backyard series features entertaining stories that answer many questions children have about the habits and habitats of the animals in our own backyards. New features only available in this interactive omBook include professional narration, background audio and enlarged artwork for each scene. To promote reading in young children, individual words are highlighted as the story is read and words zoom up when pictures are touched. By combining the original text and artwork with features that educate, entertain and promote reading, this omBook appeals to readers of all ages. Cozmo is an alien who’s having one of “those” days. He’s trying to get to work but nothing is going right. Full of fun an color, this app goes wild with such inventions as an adorable robot chef (who doubles as a popcorn machine), zooming personal spaceships and bulbous cityscapes. Cozmo’s Day Off is available on iTunes HERE. If you are in the mood for another and interactive story, check out the enhanced digital eBook for kids, The Ultimate Guide to Charlie and The Chocolate Factory! What great books apps have you enjoyed lately? Now Available on Amazon and GumRoad! If you want to be among the first to know of special “dragon-y” updates, activities and specials, sign up below and we will keep you in the loop. Thanks for your support and Read On! Sign up for Dragons Are Real Updates! Thank you for article. I’m fan of paper books, but idea about eBooks for children with different creative points is very interesting. Because in usual books we can’t realize many extraordinary decide.